Comparatively, Chess and dance are both social practices that are adaptable to local customs and contexts; the differences in the way chess is played in China versus the U.S. reflects the culture of each area. In addition to its competition aspect, chess, like dance, is a means of bringing people together and involves balancing and integrating parts and the whole, as well as the arrangement of those parts into meaningful patterns. In Chess, Kun-Yang has the company members work with the concepts of resistance and discover how group dynamics affect the space. The piece involves difficult partnering which incorporates transferring body weight and understanding the way your partner moves and thinks. Only three out of the ten current company members were dancing for KYL/D when the piece first premiered in 2013, so it is crucial for the dancers to develop strong relationships with their partners in order for the movement to be executed successfully. As I continue to observe rehearsals, I understand Kun-Yang’s rehearsal process is all about working together as one family. Dancers will often work in duos or small groups after Kun-Yang has given them a task and later share what they have discovered with the group. 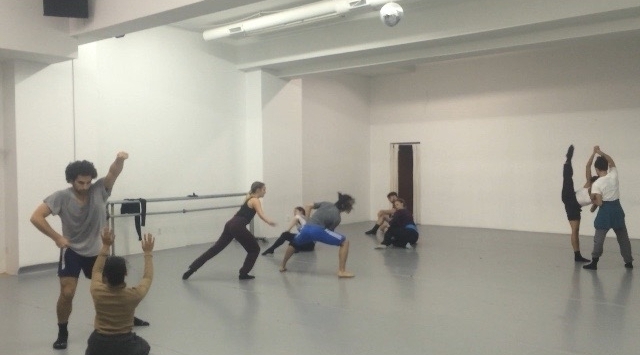 This method of creating and understanding choreography helps all of the dancers understand the individual connections being made without the overwhelming experience of everyone sharing their ideas at once.